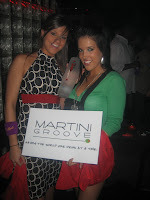 When I got a few bottles from Martini of their latest stuff, I wasn't in that big of a hurry to try it out. Sure, the bottles looked new, and snazzy, and much, much bigger, but no big deal, right? I was completely surprised when I opened up the bottle of Rosso. Sure, the stuff has been around since 1863 (it was the original vermouth), but I hadn't had much occasion to taste it by itself, except maybe in a Manhattan. The rich flavors and taste of caramel made it an instant hit with everyone in the house at the time (that is to say, 4 people and several stuffed animals who claimed they were old enough to drink). Make sure you have some of this in your bar. It's the best US$6.99 you can spend on your bar. Though the rowdy bars and keg-standing frat parties still have their place in the world of drinking, more and more bars are turning in to suave affairs with rules and a bit of circumstance. I'm all for the sakebomb, the body shot, and Purple Hooters, but those are occasional things. 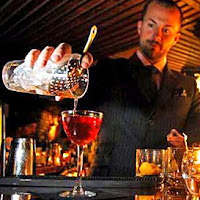 As more and more flavor varieties come out in an alcoholic form, bartenders are creating taste sensations that are meant to be savored and discussed in a civilized manor. The LA Times has published an article that sums up the basics of the new rules for the new bars that are creating tasty treats for the few to enjoy, rather than the Watermelon shots for the masses. The basics? No yelling, no annoying name-dropping, introduce yourself, don't leave the bar like you just came from a bachelorette party, and introduce yourself to someone you don't know. I like the last one a lot because it beats just staring at a girl's breasts until she calls security on you. Anheuser-Busch is breaking in to the vodka market with a fairly solid vodka offering through it's beverage development subsidiary, Long Tail Libations. The vodka is made from organic Italian wheat, blended with water from the Italian Alps. The people that actually make it are a 3rd generation distiller that A-B farms out the process too. Distilleria Sacchetto column distills the alcohol 4 times then filters the alcohol through 1.7 million square meters of charcoal. Right now, Purus is only available in select spots in the Northeast. Maybe all you need is a decent vodka, a twist of lemon, and a shaker for your bar because a crisp vodka martini suits you just fine as your drink of choice at home. But what happens when you have people over and they want a gin martini? Or a Tequila Sunrise? Or, if they're a 22 year old girl and just started drinking, a Hurricane? The San Francisco Chronicle has your solution: the bottles and brands that every basic bar needs to contain. You may not know your gins from your tequilas but they can help with some great recommendations. There are a few Bison Grass vodkas out there, but there's only one made from Bison Grass located in Europe's last primeval forest. The vodka has been made in Poland since the 14th Century and is now coming to the U.S.
A herd of 400 Bison live in the forest where the grass is taken from, so it's almost like you're communing with nature as you enjoy the vodka that is said to be very aromatic. The press release says that the vodka hasn't changed much in 400 years, but the website says it hasn't changed much in 600 years. I think they need to figure out which it is because if it's the time of Henry IV's reign, there's *no way* I'm going to mix it with the same stuff as I would if it was the time of Western Hemisphere Colonization, that just wouldn't make sense. Probability is, you want your parties to be as fun as mine rather than the kind that the people only show up to because you're holding their small animals hostage and threatened to sell them to a gourmet restaurant unless they show up. Kahlua's got a new site full of party tips from people who actually know how to throw a hip soirée including "Top Chef's" Ted Allen and Super Mixologist Tony Abou-Ganim. The tips range from the simple (Introduce two people that might get along) to the slightly simpler (Make sure you have all the necessary information on an invitation). Hey, throwing a good party isn't rocket science, but leaving something simple out can make your party look like the Tri Lamba and the Alpha Mu's party in "Revenge of the Nerds" (Before the weed comes out). The super-awesome, funkadelic, Natalie MacLean has brought out 10 of the best wines for pairing with turkey. 8 out of the 10 are under US$25, so they won't leave you feeling like you need to go broke because you invited 25 people over for your roast beast. My favorite? The 2005 Maison Champy Bourgogne Signature Pinot Noir for US$18.95. It's one of my all-time favorite, low-cost Pinot's. The Scotch Blog is having their annual awards for various Scotch related activities. This year promises to be bigger and with more categories, you can even submit your own category for consideration. It's a true People's Choice award! How else can Tom Cruise win an award for something? So head on over and submit your category and look for voting to start soon! David Kanbar's uncle was the founder of Skyy Vodka and he later became an executive at the company. Once he left Skyy, he started his own Gin and is now moving on to his own rum. The rum is labeled as "Rum for vodka drinkers" as it is triple-filtered and distilled four times. David's wife used to get rum headaches so he wanted to make a rum that he was sure wouldn't make her noggin crack. The rum is made in the British West Indies, but because of the distillation and filtration process, it has to use a time-consuming slow distillation process in order to keep the characteristics of the sugarcane. It also means that the rum is made in very small batches, adding to each bottle's uniqueness. The bottle itself is even a bit of a story. It is packaged in a cosmetic quality glass bottle with silk screened horizontal lines, a pink label and wood cork with a silver medallion. There's two things I'm always on the lookout for: The perfect hamburger and the mind-blowing Gimlet. The traditional Gimlet is pretty straightforward and a great way to get someone to start liking gin who may not be that in to it, even those that watch you order gin and the first thing out of their mouth is "I can't drink gin." Tell them that this isn't the Beefeater that their grandma drank/used for disinfecting. The ZAP (Zinfandel Advocates & Producers) Festival is what every wine nerd is wishing for. It's what Comdex was to nerds. What the Love Festival is to ravers. What the San Diego Comic Con is to...well...nerds. I'm telling you all of this now, even though the event isn't until January 23-26, because I love you. I want you to have the time to get cheap flight tickets, to book your hotel room, to let people know that you'll be in San Francisco for 3 days and they should be there too. On Wednesday you'll be going to "Flights" with some of the big brains of wine. On Thursday is the Wine and Food Pairing. I went to this one last year and was blown away. I got to drink some Zinfandel's from the 70's and eat it with food prepared by one of America's top chefs. I learned more about wine and food pairing in this few hours than the wine steward at Applebee's did over his entire lifetime. Tealeaves.com did an instruction video on how to make a Sidecar (The drink, not an actual sidecar, you Hogan's Heroes loving genius). Unfortunately, they made it in a wine glass. I always find it interesting how most people who make drinks talk about drink purity until they decide there's something that they don't like, then it's okay to change the drink however they want it. But why in a wine glass? They made a short video as to why and I have to say, it's even a little bit valid. Stiletto Vodka is girl-power, personified. It brings together old-world Russian know-how and plops it in to the heart of New Orleans, the land of Kick It Up A Notch and is owned by women who clearly love the stuff. The wheat vodka is six-times distilled and five-times charcoal filtered. It comes in straight vodka flavors as well as mint, chocolate, and vanilla. 25 Cents from each bottle goes to breast cancer research and another 25 cents goes to help a program that finds mentors for at-risk kids. I'm already feelin' the love. The bottle is sleek and is well-designed to match the name of the stuff. Though the vodka is produced in Russia, it has New Orleans' sense of style when it comes to the bottle itself. Martini's are such a difficult concept that Waring thought they would make it easier on all of us. Okay, so I know that the reason for having this is for Coolness Value and not for the idea that you actually need a machine to mix your martini's. 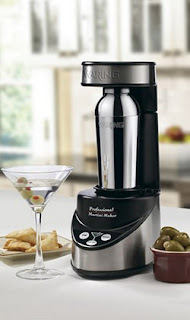 The Waring Pro Electric Martini Maker can take your concoction and do the tedious work of mixing it by either stirring or shaking, depending on which button you press. Remember kids, stir gin, shake vodka. The on light even has a green olive on it. But what if I want a twist?